It is quite obvious that the gadgets which have amazed us in sci-fi films are becoming our reality. I will never forget the almighty watches Mr. Bond, James Bond used to wear or the ultimate sunglasses Tom Cruise made popular starring as Nathan Hunt in Mission: Impossible. Garmin and Suunto have already equipped us with a mighty watch on board, and I have already written about it. 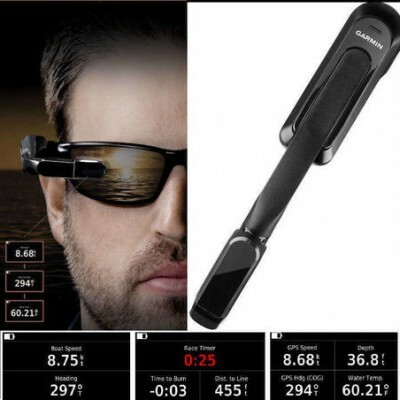 This time, I want to share my excitement with their new sunglasses, Garmin Nautix In-View Display. This device looks like a pilot’s microphone or Bluetooth hands-free earphone. It attaches easily to your own sailing sunglasses, making you look even cooler. Its purpose is to display crucial marine data in your sight line. You can forget about bending your head like an owl, trying to get an image from a standard LCD display when wearing polarized glasses. Like your favorite action movie character, you will be provided by data about boat speed, heading, water depth and temperature, wind direction and engine RPM. All that data, which is in most situations crucial, is streamed to your device from a compatible on board device. The good news is that color display is readable either on polarized sunglasses or prescription lenses. You can manipulate the displayed data with a touch panel. Just like the in-view display, the touch panel is durable and weatherproof, glove and water-friendly, so chances to mess up the data screens with sea-water or rain are put to a minimum. It is important to emphasize that Garmin Nautix keeps important NMEA 2000 data in plain sight and is compatible with the GNX Wind marine instrument, GPSMAP 7400/7600 series chart plotters and GPSMAP 8400/8600 Series Glass Helm multifunctional displays. This brand new toy is designed for fishermen who can keep an eye on depths and boat speed while chasing the catch of the day, as well as for sailors who have to maintain the distance to the start line while the start countdown watch is ticking. I am not a fisherman so the features of this device useful for sailors are what I am interested in much more. It is very nice to have all that data just in front of your eyes, but the most useful feature for me would be the start countdown watch. Starting procedure is very tricky and an important moment of any race so every second and inch matter. This is a moment when a misunderstanding between the skipper and tactician, or the skipper and his crew can ruin the entire race. In other situations, I like to have a clear view of my environment so the display would be turned on from time to time in my case. However, I know some sailing gadget-freaks and have no doubt that Garmin is going to make a good sales results among such audience.